This cruelty-free leather billfold was inspired by zellige, the lavish tilework that adorns Moroccan mosques. 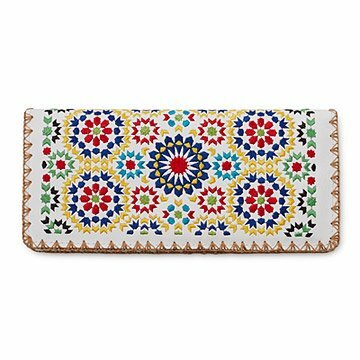 Bringing a touch of culture to your currency, this ornate wallet was inspired by zellige--the lavish tilework that adorns Moroccan mosques. Capturing the complexity and color of these historic works of art, this svelte, cruelty-free vegan leather billfold is punctuated by an embroidered pattern stitched with silky thread. Inside you'll find a vinyl ID sleeve, 12 card slots, two sections for cash and receipts, plus a built-in zippered pocket to keep your change contained. Made in China. Will be used as a wallet. The uniqueness of the product and the beauty of the mosaic design is the most attractive. I have nothing negative to say.